Chief Minister Chandrababu Naidu's uprising against the injustice done by the Center is continuing. Vijayawada Indira Gandhi's municipal grounds for the initiation of ministers, MLAs, representatives of various parties, industrial, film and sports cadre also come to the camp. 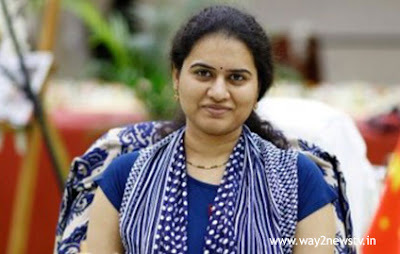 Chessplayer Koneru Humpy also came in Deeksha's place and supported her for special status. Speaking on this occasion, she said, "We are all supporting the struggle of the Chief Minister for special status and need to take our rights and get our rights. This is not just an event for a person and a party to benefit the party .. This is a matter of all people, so everyone calls for participation. Chief Chandrababu Naidu's great decision on the day of birth for the good day is a great pleasure to us. We are struggling and we are going to do whatever we want in the long run. After winning any title from the start of my career, I will get the blessings of Chandrababu she said. In our state today the sports have improved because of Chandrababu Naidu effort .. Humpy praised that this great thing will be for him. Humpy concludes that he is going to be in all the sectors and hoping to build up the Amaravati capital.